From left: Will Snowden, Mithun Kamath, Norris Henderson, and Aaron Ahlquist discuss Louisiana’s non-unanimous jury law and the amendment that would change it. Twelve men, one room, and a murder charge. Sidney Lumet’s “12 Angry Men” is one of the most respected films centered around the criminal justice system. But the overall plot, where members of a 12-man jury must agree on a verdict that could send a teenager to the electric chair, could never occur in the state of Louisiana under state law. Louisiana does not require unanimous jury verdicts in felony trials, instead allowing 10-2 verdicts to send the accused to prison for life. The abnormal verdict law stems from nearly 130 years ago, when delegates at an overtly racist convention ratified the state constitution to allow for non-unanimous juries. Norris Henderson, state director of the Unanimous Jury Coalition, explained the laws’ history during an intimate panel hosted by the Jewish Federation of Greater New Orleans. Nonprofits, traffic cameras, STRS; how does New Orleans City Council prioritize its budget? How does New Orleans City Council prioritize its budget? Joe Giarrusso III, who represents District A, and Jason Williams, elected by the city at large, discussed the city’s budgeting process and priorities with residents of the Carrollton Area Network. 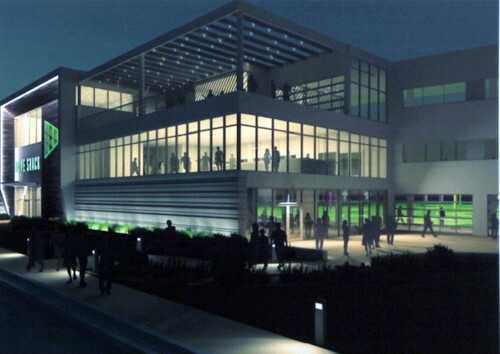 Both councilmembers used the Tuesday evening meeting to present their ideas for improvements or new allocations, with opportunities for public input. Roughly half of the city’s $646 million general funds are spent on public safety and government, according to the city’s 2018 adopted budget. 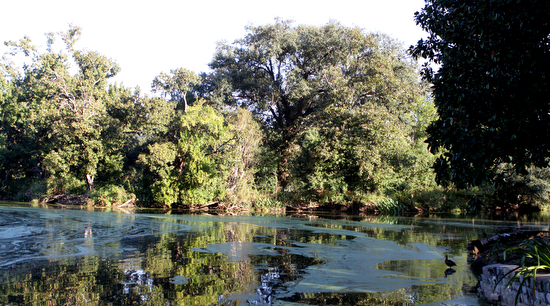 Roughly five percent goes toward public works – around $33 million – and just over $37 million put toward sanitation. Police and fire combined are allotted just over $263 million. Comments Off on Nonprofits, traffic cameras, STRS; how does New Orleans City Council prioritize its budget? 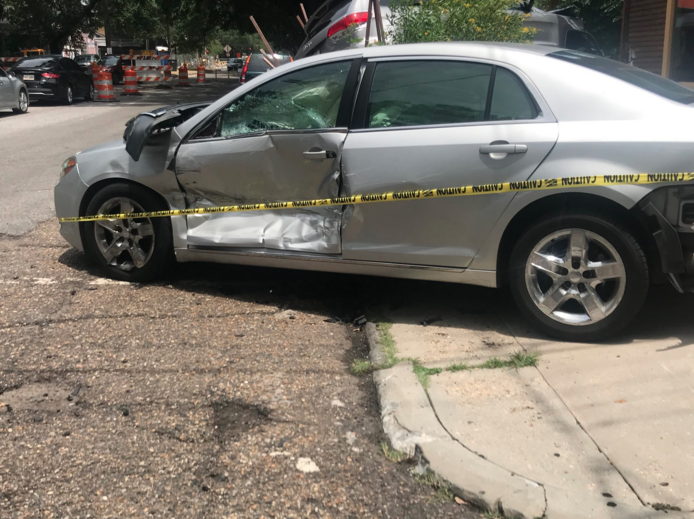 A multi-vehicle crash has shut down the intersection of Laurel Street and Louisiana Avenue (photo by Zach Brien for Uptown Messenger). A two-car crash at the intersection of Laurel Street and Louisiana Avenue has sent at least one person to the hospital. 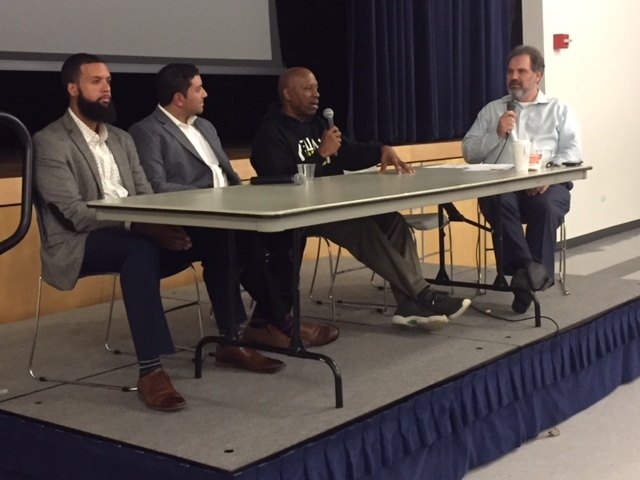 Mario Zervigon, left, touches on how maintaining relationships in the state legislature helped pass the unanimous jury bill during a New Orleans Coalition meeting. From left: Representative Royce Duplessis; Sarah Omojola, director of the Welcoming Project; and Senator J.P. Morrell. 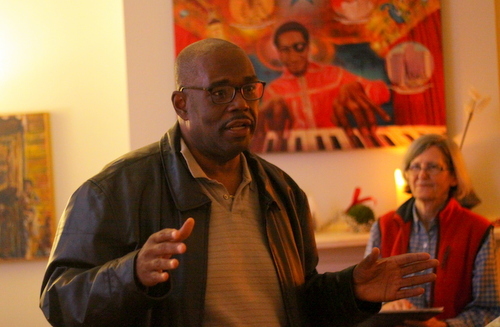 Members of the New Orleans Coalition gathered Uptown Sunday afternoon to discuss the fate of – and the impact of – criminal justice reform legislation in Louisiana. Senator J.P. Morrell and Representative Royce Duplessis were on hand to recap the most recent legislative session and how each bill was successfully passed, as well as what issues will be front and center next year. Sarah Omojola, former Policy Counsel for Southern Poverty Law Center and current Director of the Welcoming Project, touched on the legislative process from an advocacy level. Mario Zervigon, of the Zervigon Consulting Group, moderated the panel. Joanne Close and Jim Yonkus are hoping to open an intimate wine shop at 1226 South White Street, if the BZA approves a required parking variance. Developers are hoping to turn a vacant South White Street lot into an intimate wine shop, but three required parking spaces need to be waived in order for the space to be functional, the owners said. Joanne Close and her husband Jim Yonkus are aiming to open a small wine store in the New Zion neighborhood just off South Broad Street. 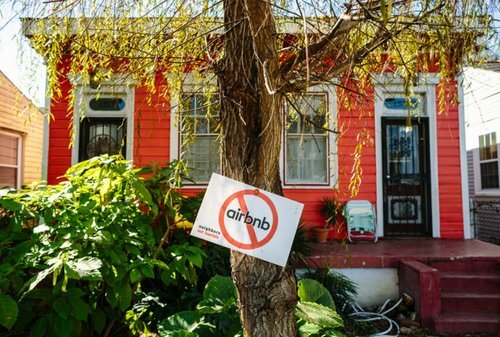 The property, a vacant lot at 1226 South White St., is zoned for heavy commercial use which requires the couple to add three off-street parking spots. But adding those parking spots would swallow up much of the already-tiny lot. Several residents in the Faubourg Marengo neighborhood say they’ve had to deal with a tar-like odor around – and sometimes within – their homes for several years, and their new City Councilman says he will try to find the cause of the smell. 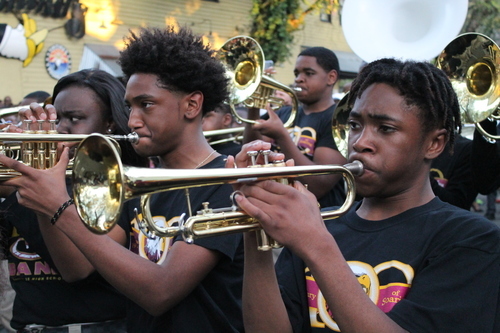 McDonogh 35 Senior High School’s marching band performs during Battle of the Bands at the “Instruments A-Comin” benefit concert, silent auction and community arts fair in front of Tipitina’s Monday evening. The fundraiser also includes a benefit concert with all proceeds dedicated to placing instruments in New Orleans school music programs (Claire Byun/cbyun@nolamessenger.com). 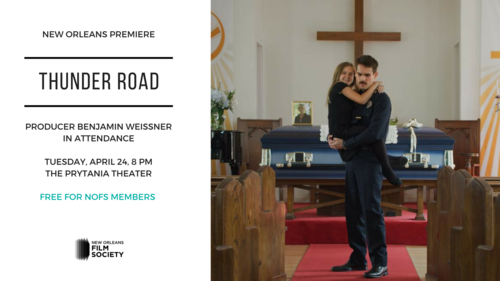 “Thunder Road” tells the story of a flawed police officer, made worse by the passing of his mother (image courtesy the New Orleans Film Society). 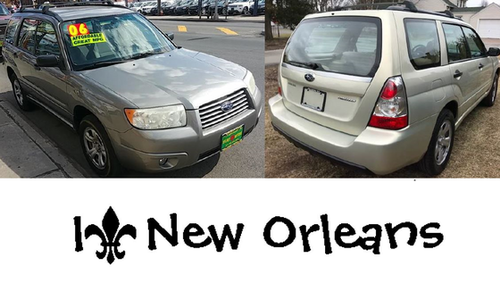 NOPD are searching for a tan 2006 Subaru Forester with a distinctive bumper sticker carjacked from Dante Street (via NOPD). 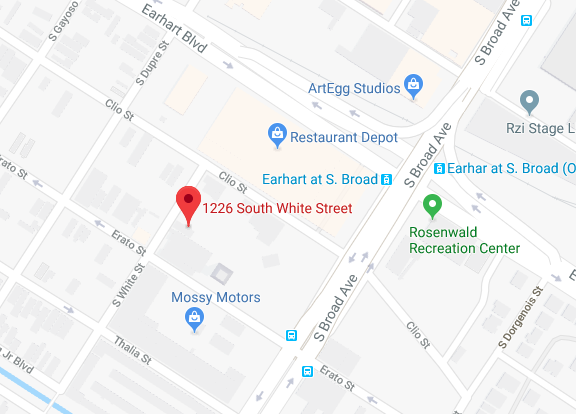 A 47-year-old woman’s car was stolen while she was dropping a friend off in the 1800 block of Dante Street late Thursday. 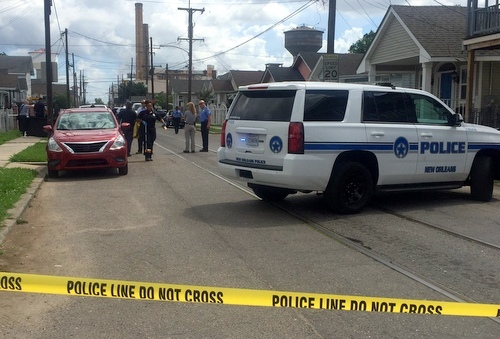 NOPD are investigating a double shooting that killed one man on South Roman Street early Wednesday, April 18. One man is dead and another person injured after a double shooting on South Roman Street early Wednesday. 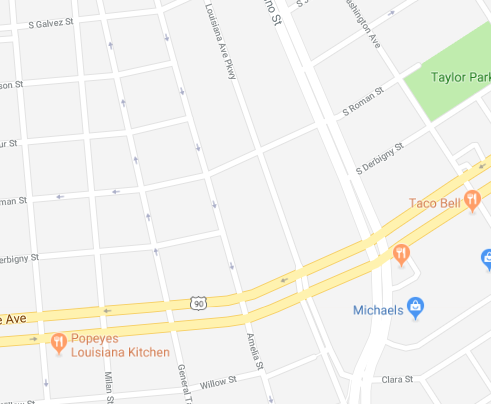 New Orleans Police Second District officers responded to shots fired in the 3600 block of South Roman Street around 4:53 a.m. Wednesday, April 18. When officers arrived they found an adult woman who told police she heard two gunshots discovered she had been shot in her finger. 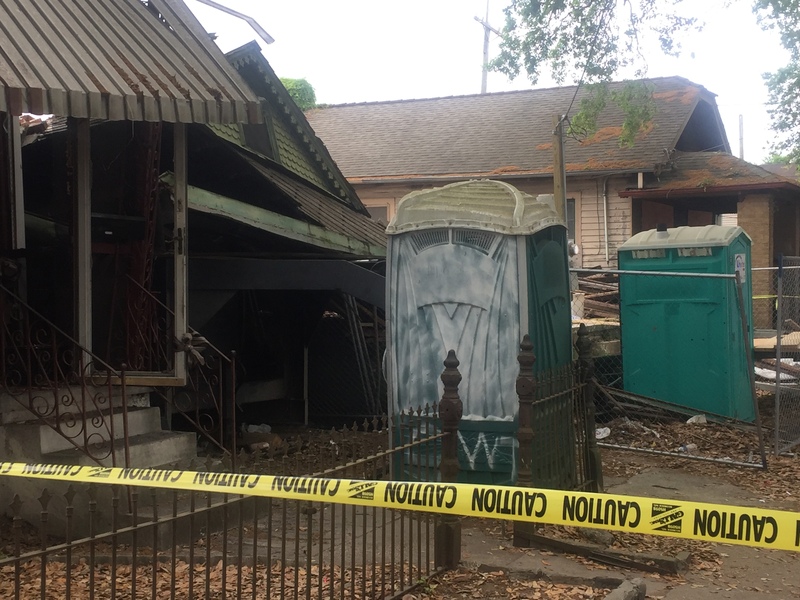 A home in the 2300 block of Washington Avenue collapsed Monday, March 26. At least one person was taken to the hospital.